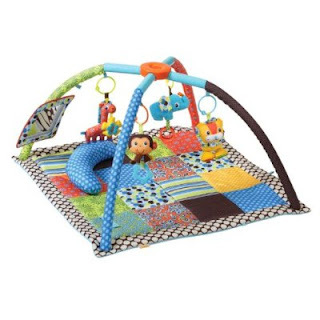 Super Hero Boy: Infantino's Twist & Fold Activity Gym is a huge space saver! 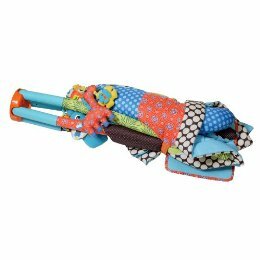 Infantino's Twist & Fold Activity Gym is a huge space saver! I've had several play gyms between Connor and Dylan and biggest complain from the very beginning is though most gyms will fold pretty flat they are impossible to store as even when you fold them up most of them end up being a mess of fabric and poles. We were given a Infantino Twist & Fold Play Gym as part of the Mom Central test drive program and it solves that problem all together and is one of the most easy to use, easy to carry, playmats we have ever experienced. No joke! Actually before the Twist & Fold came into our lives we had pretty much decided totally to skip the play gym with Dylan. Connor's last play gym is still sitting in the attic totally untouched as I really had no desire to drag it down as I'm not sure about you guys but there is four people living in this very tiny two bedroom house and the last thing I wanted to drag down was yet another toy I had to find a place to store when not in use. So we were going with the old fashioned blanket on the floor and three year old brother harassing the crap out of the baby method which I assume parents did before the invention of play gyms. heh. It really was not working out for us but I was determined not to bring another impossible to store toy out into the living room only to be left in the middle of the living room for us all to trip over. The Infantino Twist & Fold was the perfect solution. It's very innovative as it's a full sized play gym but it folds down and velcros shut so storage is a snap and you won't end up with a hard to store, hard to transport floppy play gym taking up space when your done playing for the day. To unfold the Twist & Fold all you do is undo one little velcro strap and lay the mat flat on the ground. Once you have the mat on the ground you push down on the disc at the top of the bars that hold the toys over the mat, keep pushing until you hear a click and the top of the disc stays in the down position. The toys on this gym also seem a little lower when its up than the toys on some of the other gyms we've had so Dylan had no problems grabbing the toys right away and having the best time kicking and grabbing at the really cute animals hanging over his head. We really only ran into problems when his brother decided to, as always, attempt to play with him which always ends in Dylan screaming in tears as Connor is a little intense and he always ends up either just taking the toys or getting right in Dylan's face. Luckily when Dylan is in his play gym Connor doesn't seem to be as out to get his face right in Dylan's and he has a harder time taking the toys as they are attached to the gym! Huge bonus for me and Dylan s I get a few moments to do the dishes and he gets to play without his brother totally interrupting him every ten seconds! I know I said this earlier but our favorite aspect of the Infantino Twist & Fold Play Gym is how small it is when folded up. This makes it not only super simple to store when not in use but ideal to take with you to grandparent's house or even just to play dates for a great place for your baby to play and chill out while your older kids play or even so you have a few moments to chat with friends. You can check out both versions (boy and girl) of the Infantino Twist & Fold Play Gym on the Infantino website!